New LED technology, home networking and endless calibration options help make the Toshiba 55SV685DB a prime candidate for a hi-def home cinema setup, but its flaws leave it looking like an expensive luxury. The 55SV685DB's key feature is its LED backlighting. Capable of switching on and off, according to the demands of any video source, its stack of white lights are capable of local dimming and promise the simultaneous delivery of inky blacks and bright whites on any part of the screen. On-screen menus include a Backlight Adjustment Pro that optimises performance and shows a bar measuring ambient light and a graph that plots the exact brightness. As befits the TV's status as a high-end set, it possesses some advanced picture processing circuitry in the form of Active Vision M200. Crucially, it includes a 200Hz frame rate to eliminate blur, while an additional film stabilisation mode creates extra smoothness. The last part of the processing jigsaw is Toshiba's celebrated Resolution+, circuitry that's designed to boost the quality of standard-def Freeview and DVD to hi-def levels of detail. Almost any source can be attached to the 55SV685DB's roster of in and outputs. An Ethernet LAN port powers the 55SV685DB's DLNA networking feature; plug the TV into your broadband router and you can stream music, photos and video from a PC on the same home network. In practice it's easier to get such digital media files into the TV via the set's USB Pro input. The SD card slot will only show JPEGs. Thumbnail pictures from the SD card are slow to load, while the DLNA networking is also very frustrating. Finding another PC on the network is a cinch, but actually viewing any type of media is convoluted and unreliable. The system can play MP3 music and JPEG photos, along with AVI and MPEG videos, but basic navigation is slow and dogged by delays. The biggest problem by far is the remote control, which doesn't take charge of these features. Skipping back a step isn't possible and the TV is often left 'hanging'. An Auto Brightness feature removes the harshness of the factory settings. It's especially useful since a lot of users will avoid the complicated menus. The 55SV685D's delivery of Blu-ray is breathtaking; it handles hi-def scenes from NASA's Greatest Missions with rare skill, seeking out endless detail of the Discovery ship as it launches from Cape Canaveral. A pin-sharp – though rapidly moving – helicopter leaves a trail of visible heat as it swoops by the rocket; the backdrop of billowing exhaust clouds and the ultra-bright orange tail of fire from the Shuttle look absolutely stunning. The LEDs are doing their work here, separating bright areas of the image from the duller background with astonishing accuracy. When the Shuttle does reach space, the surroundings are jet black, whilst at the same time dark areas of its fuselage are clearly detailed. The quoted contrast ratio is hard to believe, but it is impressively high, while the picture remains free of haloing. A more testing passage from The Matrix Reloaded demonstrates the 55SV685D's skill with motion and judder. The 200Hz scanning defines images slightly clearer on its own, but switch on the film mode and Blu-ray judder vanishes. The camera pans smoothly downwards into the depths of Zion, a shot that tends to lack stability on most LCD televisions.In another breathtaking scene, the edges of the fast-moving Nebakanezer are rendered silky smooth. However, the 55SV685D's treatment of digital TV pictures is frankly shoddy. Freeview and even cable channels suffer from noise, stepped diagonal edges and blocking, to the extent that they just don't look real. That's not excusable at this price, and especially on a set that has Resolution+ onboard to upscale SD sources. This system, when used on its lowest setting, does work, but even 720p hi-def footage on BBC HD looks soft. As a rule, the bigger the TV, the better the sound and the 55SV685D proves this with plenty of stereo separation and a noticeably bigger range than on smaller sets. Using the standard setting, background effects are well-defined, with clear dialogue and the overall sound free from distortion. If you're after a large screen with the latest LED technology for a dedicated home cinema system and you watch only Blu-ray, this set is hard to beat. 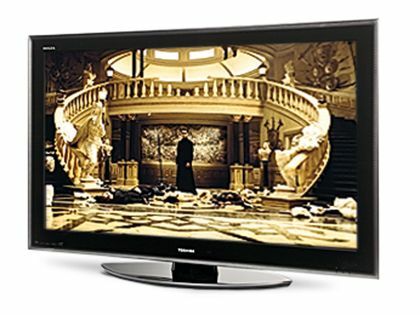 But there are cheaper plasma TVs available, which can deliver digital TV and DVD pictures that are far superior and in a more user-friendly manner.